If patience is truly a virtue, a large contingent of the Jazz fan base are eligible for sainthood any day now. For the past two-and-a-half seasons, I, along with countless others have incessantly clamored for a changing of the guard – as it became crystal clear that (without Deron Williams and Jerry Sloan) a team centered around Al Jefferson, Paul Millsap and a cast of mediocre vets was simply not good enough to come anywhere close to contending. 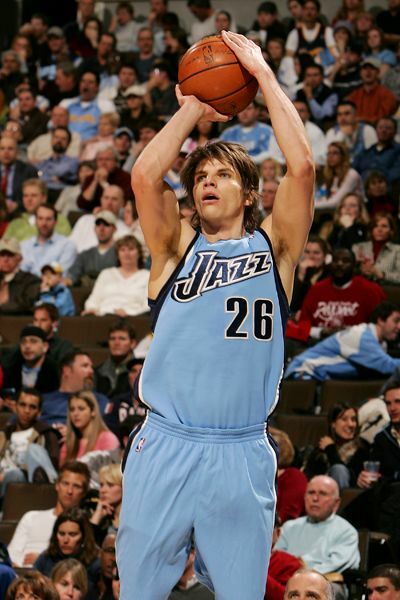 When Utah decided it had spent enough time in NBA purgatory (consecutive seasons finishing 8th and 9th in the West) and opted to let all of its free agents walk and turned $28 million worth of cap room into future draft picks and the poo-poo platter of Andris Biedrins, Richard Jefferson and Brandon Rush – it signified the Jazz front office had finally turned the future of the team over to their Core-4. (Or Core-5 if you include Trey Burke – whom Utah traded up to get in the 2013 NBA Draft). After all the mind-numbing “Why isn’t Hayward staring” and “Why isn’t Favors in the game for this last possession?” and “Alec Burks DNP-CD’s” and “12 minutes for Enes Kanter” and “Did we re-sign Evans to a 3-year deal just so he can be in the dunk contest” questioning – the 2013-14 Utah Jazz can take the most critical step in rebuilding which is embracing the young talent and potential they already possess. Next week we’ll take a more in-depth look into Utah’s 2013-14 roster, analyzing the new faces and what they do (or don’t) provide as well as the individual improvements Utah’s returning players need to make to take their games to the next level. For now, as a broad overview to the 2013-14 Jazz there’s one aspect which excites me the most about this team’s potential. That attribute is based off the ability and talent they possess, this year’s Jazz team has the capability to bring back several elements of Jazzbasketball that have been lacking in recent seasons. Utah no longer has a volume 18-20-point scorer who they can dump the ball down into every possession. While Favors and Kanter have shown strides in their low-post games, this team isn’t good enough to revolve the offense around a single player (I would also say we weren’t good enough the past two seasons either in which that was much of the philosophy). To score efficiently, Utah will need to manufacture some baskets in the halfcourt setting with crisp ball and player movement. Perhaps the biggest stride the Core-4 made last season was demonstrating they all have the ability to run both high and side screen-roll when given the opportunity to do so. That, combined with the fact that Favors and Kanter were also Utah’s best screening bigmen – and hopefully the Jazz will return to using the pick&roll as a primary set on offense rather than only a fallback plan when working against the shotclock. And if by chance Favors and Kanter breakout with a dominant low-post game, Utah will still be all the better blending that with a well-rounded and balanced offensive attack. Everyone is aware of the incredible defensive potential ability (he’s already that good) of Derrick Favors. He has all-NBA potential at that end of the floor – the key will be learning to stay out of foul trouble playing 30+ minutes (something he struggled with when starting the 2011-12 season ahead of Paul Millsap). Last year I felt Enes Kanter’s defensive ability was underrated. In today’s NBA, a big’s defensive ability is primarily dependant not on low-post defense but on how well they can defend screen-roll. Last year Kanter had a lot of good moments. While he won’t wow you with his lateral quickness, he looked quite solid in terms of effort and ability to step out and cut off driving lanes and then still recover to the screener. The pick&roll defense he and Favors played during the first-half of Utah’s big win over the Miami Heat last season was some of the best they played all year. Both bigs have great size and rebounding ability. What Utah needs to do is employ a defensive gameplan similar to that of an Memphis or Indiana where they funnel dribblers into their length rather than their baffing screen-roll defense from last year that Grandland’s Zach Lowe picked apart. If the Jazz are able to make significant strides defensively, they can really reap the rewards by pushing the ball in transition. 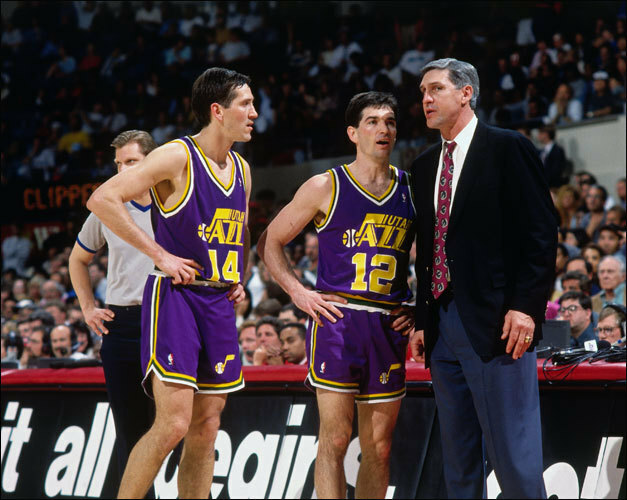 Although they’ve always been known for their half-court execution, all the great Jazz teams loved to run at home and with their young legs and athleticism it would be ideal for Utah to regain their tremendous homecourt advantage by running on teams. Not only do they have the initial altitude factor (which opposing players have said does have an effect), but the energy of the Delta Center/Energy Solutions Arena crowd can turn routine 4-0 runs into momentum shifting 8-0 runs. Trey Burke was a dynamic playmaker at Michigan. I think Burks and Hayward thrive in an open-court game and Favors has the athleticism (and now the mentor) to make running the floor a primary objective as well. The effectiveness of pushing the ball can’t be measured solely in fastbreak points because often high-percentage opportunities arise not only in delayed breaks but in the ability to get into a halfcourt set early, before a defense has the chance to set up and calibrate where they want to help from. Utah doesn’t have the advantage of having a go-to scorer to bail them out with the shotclock winding down. Looking for early offense should be a primary focus in training camp. With a less than stellar bench and starters who possess little experience leading, these improvements may not translate directly into the win-column – but hopefully will create a winning formula that can be aesthetically pleasing to watch while serving as a foundation for Utah’s long-term growth and development. With crisp ball/player movement, active interior defense and oodles of athleticism – in comparison to the past few seasons I expect this year’s team to look like they they’re playing at the speed of sound. Awesome video! I think the C4 is gonna make this a really fun season! I see us getting 27 wins. Will give us top 5 pick I hope.